The only certainties in life are death and taxes, according to Benjamin Franklin. So you’d think that, given the 100 per cent inevitability of our demise, we’d make pretty damn sure that we knew a heck of a lot about it. But no. We have every kind of instruction, information, advice and guidance on how to live — but none on how to die. We have to study and pass exams to do jobs, and even to drive a car. But nobody teaches us anything about dying, or expects us to be proficient in what we do when we shake off the mortal coil. Particularly today in the West, we live in denial about death. We hide our dead bodies away and if anyone talks about death, they’re accused of being morbid. Going back into prehistory, the shaman of the tribe would act as the psychopomp, and guide or carry the souls of the dead into the next dimension. The shaman psychopomp appears in the mythology of just about every ancient civilisation. This is because shamanic practises were once worldwide and so people were once taught how to die. 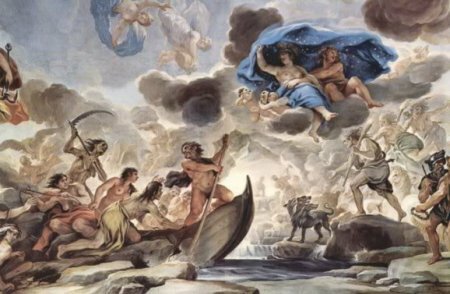 Charon was the Greek ferryman, or psychopomp, who ferried the souls of the dead from the land of the living to Hades. The actual journey isn’t anything like this painting of it, by Luca Giordana. But it shows how we, in our ignorance about death, have come to view this natural rite of passage as a chaotic and terror-filled nightmare. Perhaps the most recent literary psychopomp is Virgil, who conducted Dante through the nine circles of hell in Dante’s Inferno. But that work is political more than spiritual and is very much filtered through a Christian lens with Hell in the place of the Underworld where the Ancestors live. However, going back before Dante and the post-Plato Greeks, these mythological stories were in fact used to teach the death journey … the journey the soul would take at death. And the practice was carried on in the Neolithic and onwards by the Tibetans, the Indians and the Egyptians at least … and possibly others that we don’t yet know about. Sadly, in the past two thousand years, the historicisation of myth — making metaphor literal — has destroyed this body of knowledge. We are taught nothing about the death journey because nobody seems to know anything about it apart, that is, from those who return from having a Near Death Experience (NDE). But it’s still not much help. 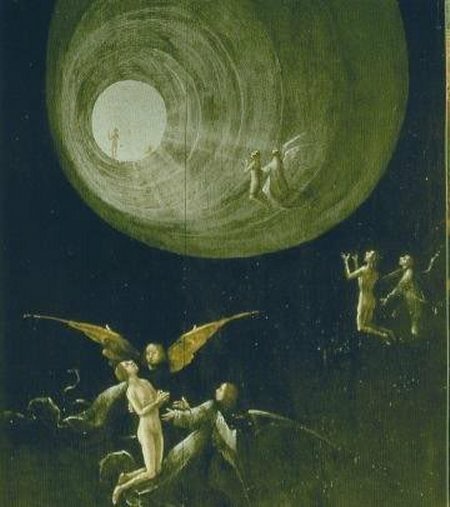 If a person “returns from the dead”, it means that they never got any further than the first gate out ~ the so-called ‘tunnel’ ~ which is the passage that takes us into the next dimension. The reason there are no teachers now on how to die is because empirical science has debunked literal Judaeo-Christianity. We know there’s no heaven with angels and harps, or a Hell with a horned Devil that roasts sinners all moaning and gnashing their teeth. So we’ve rejected the whole lot. In the Journey of Coming Forth by Day (otherwise known as the Egyptian Book of the Dead) the death journey was taken at night, and the deceased followed the arc of the sun from sunset, down into the Underworld and the back up again to its eventual dawning in the Land of Manu (the East or India). That is why this night journey of the soul of the deceased is known to the Egyptians as Journey of Coming Forth Into Day. It is a story of death and rebirth, as the soul is reborn with the rising Sun at dawn. Today, shamans are beginning to work with the dying again; helping to guide them through the death journey. I’ve personally had the honour of helping many souls in this way and I certainly regard it as privilege when I do so. There’s nothing more satisfying and rewarding than in showing that death, as we’ve been taught about it, is an illusion, and that their first destination is such a beautiful place, almost like a Paradise, where they will rest and recuperate until it’s time to come into incarnation again, wherever that is. I wish more people knew about this. But because it’s not known about, and the practice of psychopomping has been, at best, kept underground for the past two thousand years at least, there are many souls still waiting to be crossed over. Most disembodied souls, it has to be said, do eventually find themselves going in the right direction and get to the correct place in the end. Problems only mainly occur when death is sudden and unexpected. For instance, there are still many in need of a psychopomp that were soldiers who were killed the First World War. So many young men died suddenly in that terrible conflict, as they were sent out of the trenches with their hearts full of daring-do and flushed with the glory of serving their country, only to be rapidly and unceremoniously mown down. Even now, shamans I know encounter these disembodied soldiers and, in many cases, they don’t even know that they are dead. There is something also which I haven’t seen, but which other shamans who do a lot of psychopomping work talk about. They call it the Pile Up. It’s a huge log jam of souls waiting for someone to come, to help them to cross over. We encounter these disembodied souls quite a lot in Glastonbury too, because this place was, for thousands of years before Christianity, the Land in the West where the people came to die. So the deceased that are aware of that reputation will try to gravitate here. I do hope that the role of the psychopomp will soon become the norm again, and that we can start practising openly in hospices and nursing homes. But first of all, we all have to lose our fear of death, and our fear of talking about it. That would be a good first step. The Tibetans, of course (whose Bardo T’ödröl was dubbed ‘The Book of the Dead’ by its first, Theosophical, editor in honour of E. A. Wallis-Budge’s misnaming of its Egyptian analog), have been guiding the dead since time was. More particularly, the cycle discovered by the 14thc. treasure revealer or tertön, Karma Lingpa, and known – in Tibetan – as ‘Liberation by Hearing in the Intermediate Sate: Meditation upon the Peaceful and Wrathful Deities’ and a similar, though shorter cycle by the 17thc yogin and master, Tsele Natsog Rangdrol, contain detailed instruction on the nature of mind, the progressive dissolution of the bodily energies, quitting the body and the nature of the visions that arise once the consciousness is free of a material support plus instructions on how to find an auspicious rebirth. The former has – finally! – Penguin Books hung onto the damn thing for 30 years before they dared! – been published in full in a masterful translation by my friend Dr. Gyurme Dorje, and the latter is available in translation by Erik Pema Kunsang, under the title of ‘The Mirror of Mindfulness’, from Rangjung Yeshe Publications. If anyone is interested, I have a brief version of this latter text, written by Tsele Natsog Rangdrol as an ‘aide memoire’ for practitioners. Those who might be interested in a copy can contact me at crowspeaks (at) gmail (dot) com. Essential knowledge; this is barely the tip of the iceberg. Not only has Western secular culture forgotten that death is part of the life cycle; it has abandoned the soul itself. Some of the people I love dearly disavow the existence of the soul, which gives me great pain, for their sake. Caring for the soul is a huge part of my shamanic practice and led to my serving as a hospice volunteer–not to bring a shamanic agenda to the presence of the dying person, but to be there as a compassionate presence and allow their soul to do what it needs to do, regardless of the person’s belief system. I’m grateful you are writing about this, Ishtar, and hope you’ll write more. The big gap and frustration for me as a practitioner is knowing how important these healings around death are and struggling for a language that can bridge the gap with people who have forgotten how to nurture their souls. I have encountered the same attitudes around death Ramona? I guess this is where patience is a virtue? Thanks for writing on this subject Ishtar.